They used a high-throughput sequencing technique called Restriction-site Associated DNA (RAD) tagging to make the discovery. Their results, which focus on the pitcher plant mosquito, Wyeomyia smithii, are published in the journal Proceedings of the National Academy of Sciences (PNAS). RAD tagging is an effective and straightforward way of barcoding sections of genomic material, much as grocery items are coded at the local supermarket, say the scientists. "This project demonstrates the power of genomics technologies, which can provide new knowledge about the vast array of Earth's species," says Sam Scheiner, program director in the National Science Foundation (NSF)'s Division of Environmental Biology, which funded the research. "Although this small mosquito has become the poster child for genetic response to climate change," says William Bradshaw, one of the paper's co-authors, "its evolution during post-glacial invasion of North America has been a question." Using the RAD-Tag approach, the scientists have demonstrated that post-glacial populations of Wyeomyia smithii originated from a southern Appalachian Mountain refugium after recession of the Laurentide Ice Sheet some 22,000 to 19,000 years ago. Range expansion into the previously glaciated north proceeded in a sequential, ordered wave rather than by a "hit-or-miss" hopscotch process, the biologists found. With this detailed information, they will be able to determine the genetic mechanism underlying photoperiod response to rapid climate change--responsible for the correct timing of dormancy, migration, development and reproduction in temperate organisms. The knowledge will act as a template for research on blood-feeding in mosquito vectors of dengue, encephalitis and malaria. The mosquito in question lives within the water-filled leaves of the purple pitcher plant, Sarracenia purpurea, also known as the side-saddle flower, whose range includes the eastern seaboard of the U.S., the Great Lakes and southeastern Canada. 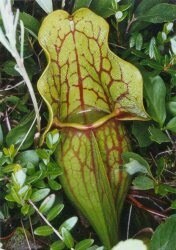 Sarracenia purpurea is the most common and widely distributed pitcher plant, and is the only member of the genus that inhabits cold temperate climates. Where the purple pitcher plant is found, so, too, is Wyeomyia smithii. Before the time of Darwin, biologists sought links between apparently related groups of plants and animals with an eye toward understanding the world around us. Relatedness was first described primarily as similarity in morphological characteristics: broad groupings of organisms were classified into orders, families and genera, much like one describes resemblance among one's extended family. Early classification of organisms became more refined as developmental, physiological and behavioral observations were incorporated into these broad categories. With the revelation of gene-based relationships, the search for an increasingly detailed understanding of genetic patterns became a driving force throughout all biological disciplines. New technologies heralded new advances. "We have now arrived at an era in which genetically similar groups can be clustered quickly and at very low cost to effect a near-endless number of applications," says William Cresko, also a co-author of the PNAS paper. Researchers can accurately describe genome-wide variation to shed light on evolution at the population level, to predict patterns of invasion of species during rapid climate change, and to correlate gene-based illnesses with susceptible human populations on a local or worldwide scale. "The RAD-Tag protocol has increased the resolution of genetic relatedness among populations by 100-fold over previous molecular approaches," says Bradshaw. "Along with the ability to illustrate the fine-scale phylogeographic patterns in species with few or no prior genomic resources," he says, "this technique will have applications in fields from ecology and evolution to human behavior and medicine."